Celebrate 15 Years of Geocaching with the Limited Edition Trackable LEGO® Brick! 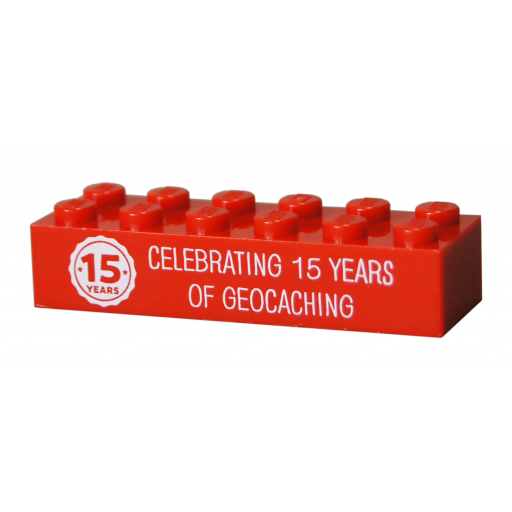 These regular 2x6 LEGO® Bricks celebrate 15 Years of Geocaching on one side, and have their own unique tracking code on the other side making them trackable at Geocaching.com! The Brick has a unique icon. This icon appears in a Geocaches inventory. If you own the Brick, it appears in the trackables section of your Geocaching profile. When people find the Brick, it will appear in their inventory and in their tracking history. Each brick comes in a protective pouch and comes with activation instructions. 5 x 1.5.x 1 cm.